A decade of discovery and development of new antimalarial medicines has led to a renewed focus on malaria elimination and eradication. Changes in the way new antimalarial drugs are discovered and developed have led to a dramatic increase in the number and diversity of new molecules presently in pre-clinical and early clinical development.The twin challenges faced can be summarized by multi-drug resistant malaria from the Greater Mekong Sub-region, and the need to provide simplified medicines. This review lists changes in antimalarial target candidate and target product profiles over the last 4 years. As well as new medicines to treat disease and prevent transmission, there has been increased focus on the longer term goal of finding new medicines for chemoprotection, potentially with long-acting molecules, or parenteral formulations. Other gaps in the malaria armamentarium, such as drugs to treat severe malaria and endectocides (that kill mosquitoes which feed on people who have taken the drug), are defined here. Ultimately the elimination of malaria requires medicines that are safe and well-tolerated to be used in vulnerable populations: in pregnancy, especially the first trimester, and in those suffering from malnutrition or co-infection with other pathogens. These updates reflect the maturing of an understanding of the key challenges in producing the next generation of medicines to control, eliminate and ultimately eradicate malaria. 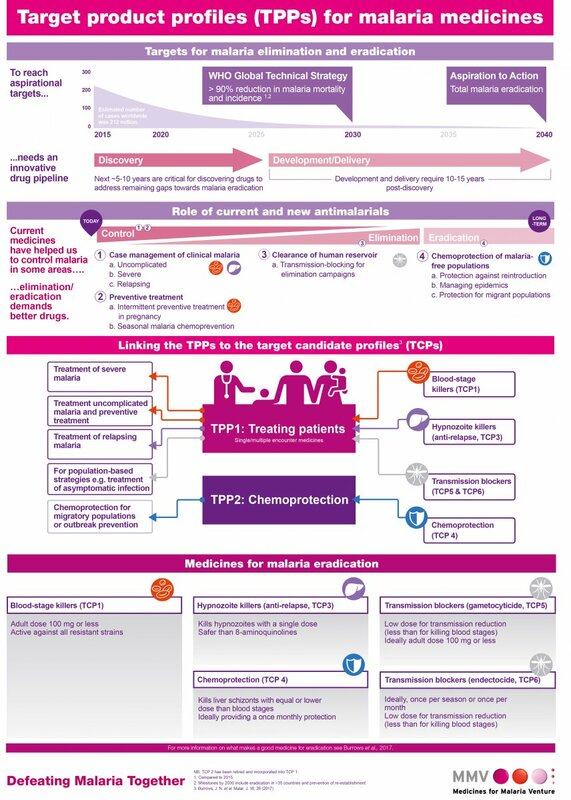 TPP-1: Case management; treatment of acute uncomplicated malaria in children or adults. Uses a combination of two or more molecules with TCP-1 activity, plus TCP-5 for reducing transmission and TCP-3 for relapse prevention, when such molecules become available. For severe malaria, a parenteral formulation of a single fast-acting TCP-1 would be appropriate. TPP-2: Chemoprotection: given to subjects migrating into areas of high endemicity, or during epidemics. Uses a combination of TCP-4 activity, potentially with TCP-1 support for emerging infections.